May 2018 50 www.sportseventsmagazine.com Small Markets...Big On Sports! Sponsored Content ocated 30 minutes west of Orlan- do, Lake County is "Real Florida. Real Close." and the perfect sports event destination. 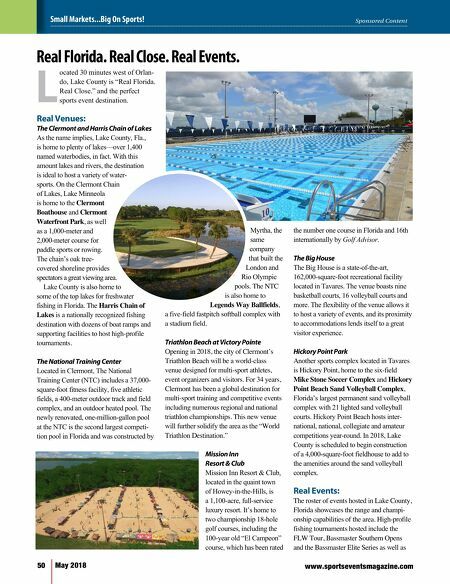 Real Venues: The Clermont and Harris Chain of Lakes As the name implies, Lake County, Fla., is home to plenty of lakes—over 1,400 named waterbodies, in fact. With this amount lakes and rivers, the destination is ideal to host a variety of water- sports. On the Clermont Chain of Lakes, Lake Minneola is home to the Clermont Boathouse and Clermont , as well as a 1,000-meter and 2,000-meter course for paddle sports or rowing. The chain's oak tree- covered shoreline provides spectators a great viewing area. Lake County is also home to some of the top lakes for freshwater fishing in Florida. The Harris Chain of Lakes is a nationally recognized fishing destination with dozens of boat ramps and supporting facilities to host high-profile tournaments. The National Training Center Located in Clermont, The National Training Center (NTC) includes a 37,000- square-foot fitness facility, five athletic fields, a 400-meter outdoor track and field complex, and an outdoor heated pool. The newly renovated, one-million-gallon pool at the NTC is the second largest competi- tion pool in Florida and was constructed by Myrtha, the same company that built the London and Rio Olympic pools. The NTC is also home to , a five-field fastpitch softball complex with a stadium field. Triathlon Beach at Victory Pointe Opening in 2018, the city of Clermont's Triathlon Beach will be a world-class venue designed for multi-sport athletes, event organizers and visitors. For 34 years, Clermont has been a global destination for multi-sport training and competitive events including numerous regional and national triathlon championships. This new venue will further solidify the area as the "World Triathlon Destination." Mission Inn Resort & Club Mission Inn Resort & Club, located in the quaint town of Howey-in-the-Hills, is a 1,100-acre, full-service luxury resort. It's home to two championship 18-hole golf courses, including the 100-year old "El Campeon" course, which has been rated the number one course in Florida and 16th internationally by Golf Advisor. The Big House The Big House is a state-of-the-art, 162,000-square-foot recreational facility located in Tavares. The venue boasts nine basketball courts, 16 volleyball courts and more. The flexibility of the venue allows it to host a variety of events, and its proximity to accommodations lends itself to a great visitor experience. Hickory Point Park Another sports complex located in Tavares is Hickory Point, home to the six-field Mike Stone Soccer Complex and Hickory , Florida's largest permanent sand volleyball complex with 21 lighted sand volleyball courts. Hickory Point Beach hosts inter- national, national, collegiate and amateur competitions year-round. In 2018, Lake County is scheduled to begin construction of a 4,000-square-foot fieldhouse to add to the amenities around the sand volleyball complex. 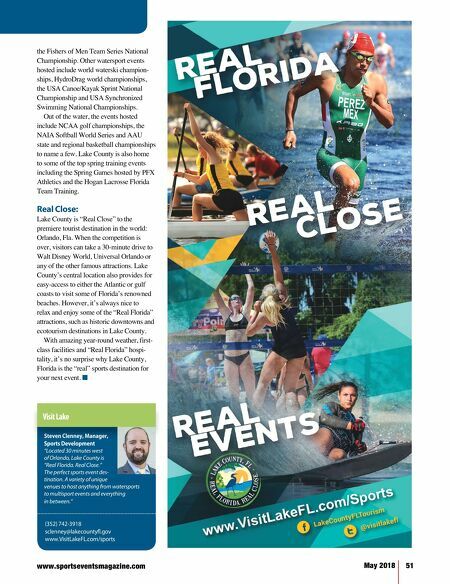 Real Events: The roster of events hosted in Lake County, Florida showcases the range and champi- onship capabilities of the area. High-profile fishing tournaments hosted include the FLW Tour, Bassmaster Southern Opens and the Bassmaster Elite Series as well as L Real Florida. Real Close. Real Events.